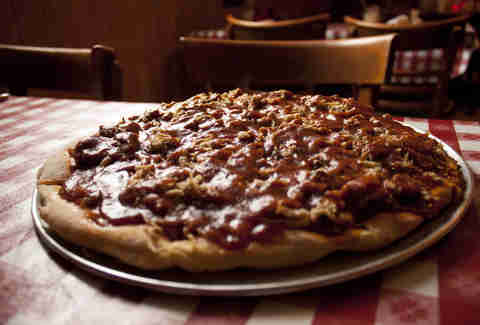 ​From pizza to nachos to spaghetti, in Memphis we'll add barbecue to anything. As someone who's devoted to sampling every barbecue restaurant there is in Memphis, and still eats barbecue on a near-daily basis, I'm asked regularly (not just by tourists), "Where is the best place here to eat barbecue?" While that question's almost impossible to answer with so many varied options in town, I can provide a list of places you should visit for a better understanding of what makes Memphis 'que special. 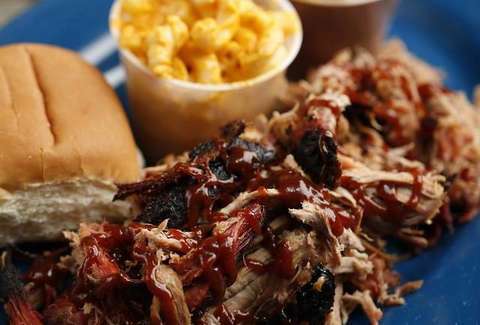 Here are 15 picks for the top BBQ joints around to start you on your quest for smoked pork. Dating back to 1922, when Leonard Heuberger opened a restaurant called Leonard's Lunch, Leonard's is the oldest surviving name in Memphis barbecue. 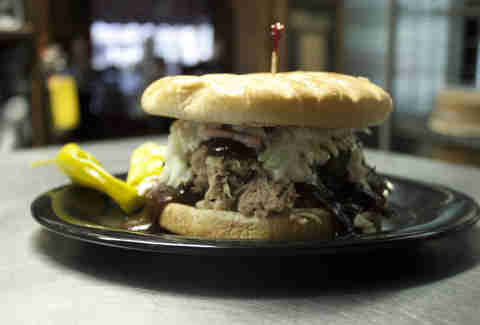 Serving coleslaw on pulled-pork sandwiches is a universal Memphis tradition that began at this restaurant, and it has some of the best ribs in the city, which you can get wet or dry. The delicious dry-rub is a classic paprika- and chili powder-heavy rendition without all the sugar that overpowers a lot of modern rubs. For good barbecue it's best to avoid the tourist-centered places Downtown. 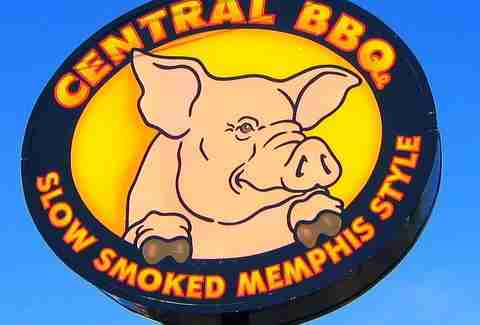 But if you go a little south of Beale St to the South Main district, to the Downtown location of Central BBQ, you'll be rewarded with a menu that frequently tops local polls for best barbecue. And since the sauces are self-serve, it's a great place to sample a variety to see what you prefer among the four options: mild, hot, vinegar, and mustard. For a traditional rural-barbecue experience in the middle of the city, the A&R on Elvis Presley Blvd is the kind of setup you normally have to drive out into the West Tennessee countryside to experience. The meat's cooked in a detached smokehouse behind the restaurant, and you should try the pork shoulder, either as a sandwich or a dinner plate, and the homemade hot link sausages. Some of the best ribs in Memphis are served at a dimly lit bar where the owner puts a Greek spin on the Memphis staple, and we're not talking about the Rendezvous. Around since 1953, Alex's Tavern is a dive bar that's pretty much always open and full of cigarette smoke. And the Greek-seasoned ribs, cooked for eight hours with apple and hickory wood in a Tucker cooker, are consistently perfect. Call ahead to see if they're available -- Alex's can only cook one case at a time on the Tucker, and when the ribs are out, they're out (but if they're out, don't hesitate to grab a Greek Burger or the chicken wings). 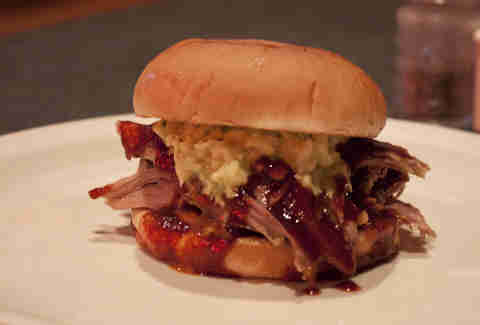 The most common form of barbecue in Memphis is the pork sandwich on a plain white bun, topped with sauce and coleslaw. There are so many great sandwich shops around the city that it's hard to choose just one, but Showboat Barbecue's 80-year-old owner, Porter Moss, knows what to do -- he's been in the barbecue business since he started working for the still-popular Tops chain back in the late '50s. Moss is at Showboat every day and still cooks the old-fashioned way: over pure lump charcoal in his old brick-and-steel pit. Nothing salvages a cold day like a bowl of his barbecue stew. 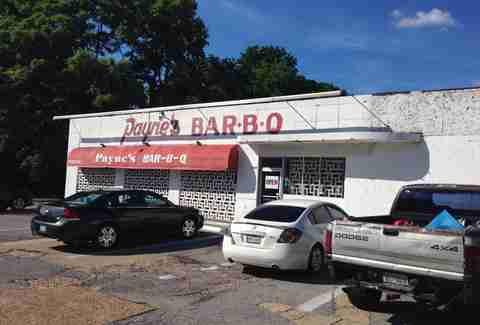 For the most intense barbecue sandwich in Memphis, try a Spicy Jumbo from Payne's. 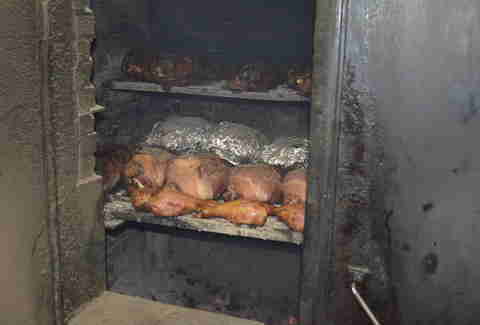 The huge portion of chopped pork also has a sizable sampling of charred outer meat from the shoulder, referred to as "bark" in barbecue circles. With generous servings of bright red sauce and neon-yellow slaw, the sandwich wallops the taste buds with a mix of smoky meat, mustard, vinegar, sugar, and spicy heat. But be ready to eat fast, as the bun disintegrates and leaves you on fork duty. Pizza first came to Memphis in the '50s, when Horest Coletta traveled to Chicago to learn to make it for service members formerly stationed in Italy. Initially it was a flop; as hard as it is to believe today, pizza seemed too foreign for most Southerners of that era. But Coletta knew Memphians would try anything that had barbecue on it, so he put a pit in his restaurant's basement and began covering his pies with shoulder meat. Elvis loved them, his legion of fans soon followed, and the back room he always requested at the original S Parkway location is still designated the Elvis Room and decorated with his memorabilia. In Memphis there are joints that offer traditional spaghetti as a side, and then there's full-on barbecue spaghetti combining pork, smoke-infused sauce, and soft, overcooked noodles. It first appeared in Memphis decades ago at the original Brady and Lil's, but when the restaurant moved to Madison Ave in 1987 its name changed to the Bar-B-Q Shop. All the while it served barbecue spaghetti based on the original secret recipe, centered around a base that smokes in the restaurant's pit for at least 12 hours. 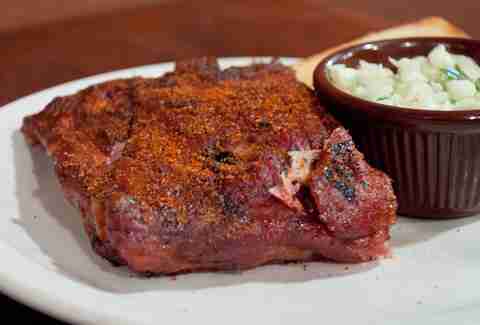 The Bar-B-Q Shop Pork Sandwich on Texas Toast and the dry-rub ribs are reliable favorites as well. The barbecue sandwich may be the most popular form of Memphis barbecue, but it's facing serious competition for that title from a more recent upstart. Barbecue nachos first appeared on a Memphis-area menu at the Germantown Commissary in 1982. Today it's hard to find a barbecue joint that doesn't offer the simple yet delicious combination of pork, cheese, and barbecue sauce on a bed of tortilla chips. The Memphis Barbecue Co. is located -- where else? -- two exits south of Memphis off of I-55 in the suburb of Horn Lake, MS. 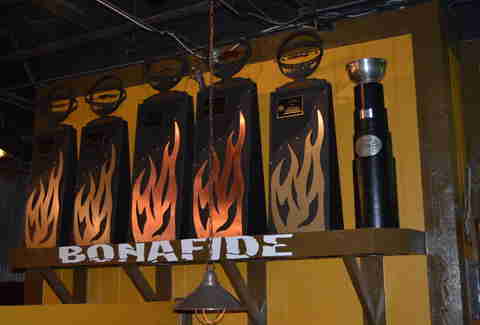 But you won't mind the commute once you walk inside the spacious restaurant and see three Grand Champion trophies from the Memphis in May World Championship Barbecue Cooking Contest. The owners are serious competitors, and the restaurant's food is as close as most people will ever get to tasting world-class barbecue from a contest of that prestige. One of the best non-pork options in town is the Cornish hen from the Cozy Corner -- just be careful about requesting the spicy sauce unless you genuinely like it molten-lava hot. 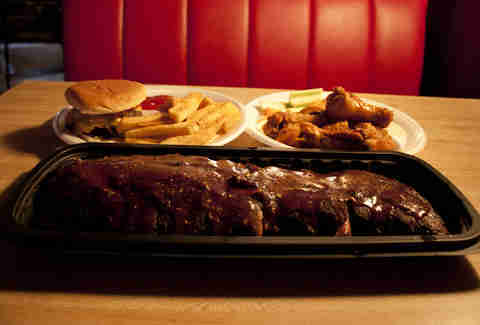 The hen is the signature item (ribs are also great), even though there's no delicate way to eat it. 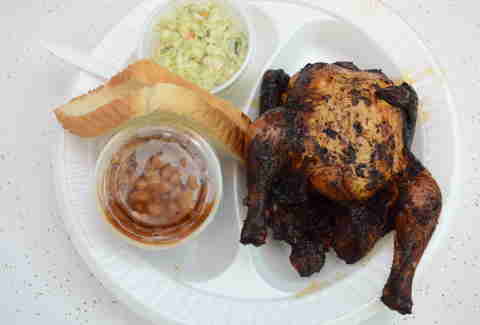 You've just got to accept the fact that you're going to have to tear that delicious charcoal-cooked little bird apart with your bare hands (maybe not ideal for a first date). You'll end up licking your fingers while trying to get every last morsel of meat off the final pile of bones. 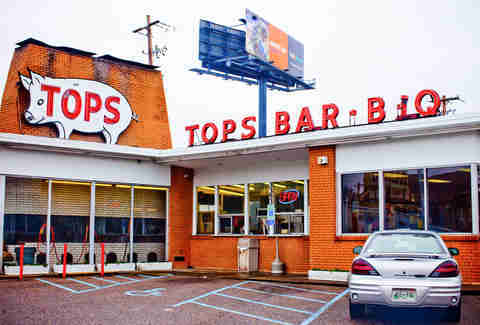 Tops is one of the quintessential sandwich shops, with 15 locations around the Memphis area. 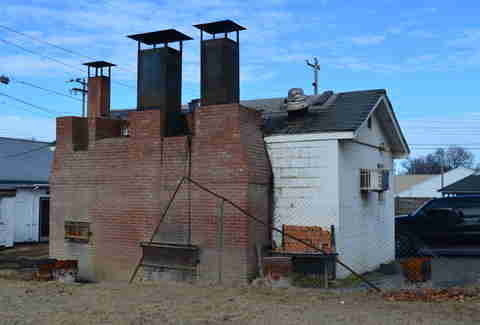 It's a local chain, but that doesn't mean any of the locations use cheap shortcuts like gas-fired pits -- they all cook their shoulders over charcoal in open pits. You'll hear plenty of locals tell you that the hand-pattied double cheeseburgers are even better than the shoulder sandwiches, but rather than debate it, the best approach is to try both on the same bun. You can order shoulder meat by the ounce, so ask for a couple ounces of chopped pork and barbecue sauce added to your double cheeseburger for the ultimate Tops experience. While brisket is generally more of a Texas thing, you can still find tasty beef locally at Elwood's Shack, tucked away in the corner of a parking lot next to a Lowe's hardware store. You'll probably wonder why one brisket taco costs $8 until you see the thing. 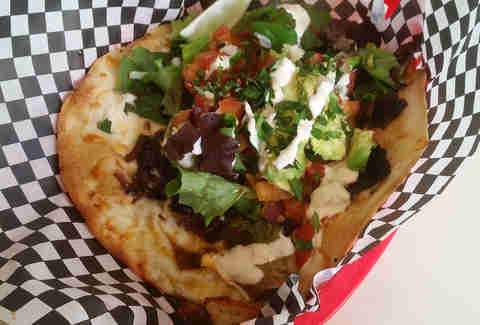 It's enough smoky meat for a jumbo sandwich, covered with avocado, pico de gallo, fresh greens, and sour cream, piled on a layer of melted cheese, inside a crisped flour tortilla. If you're there with other people, also try the trout tacos, or the pulled-pork sandwich, or the smoked chicken wings, or one of the pizzas, or really anything else on the menu. 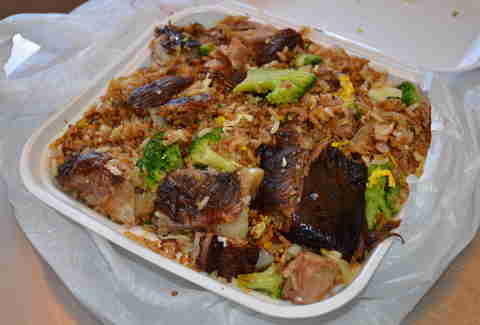 The Rib Tip Fried Rice served at KC's is one of the most interesting and delicious takes on Memphis barbecue. The place isn't a restaurant as much as a bright red trailer in a flea market at 4444 S Third St, and with its Chinese-restaurant roots, its large fried rice fills a styrofoam clamshell massive enough to feed two people for several meals. The rib tips are still a finger food since they have bones in them, so attack an order with one hand using a fork for the deliciously smoky rice and vegetables, the other hand dipping rib-tip pieces in barbecue sauce and eating them. Don't worry about manners; after one bite you'll lose any sense of shame. Pollard's owner Alonzo Pollard III is the son of Alonzo Pollard Jr., who makes the homemade hot links sold at A&R. 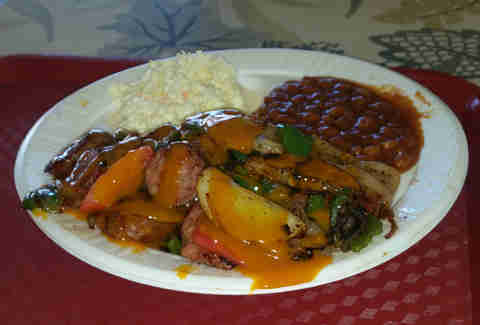 At Pollard's you can get those same hot links Ultimate-style: cut up with peppers, tomatoes, potatoes, and onions and covered with a special mustard sauce. They're homemade offsite, so call ahead to be sure they're available. Craig David Meek is a Memphis-based writer and author of the book Memphis Barbecue: A Succulent History of Smoke, Sauce and Soul. Follow him @memphisque.